Packing Way: Packed in 25KG-40KG kraft paper bags, subject to the customer’s needs. 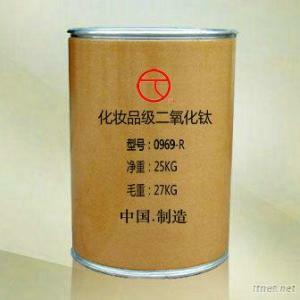 The production requirements of 0969 R are only inferior to nanometer lipophilic titanium dioxide and its effect is only inferior to nanometer oily titanium dioxide. Besides to increase the whiteness in cosmetics products, 0969 is also characterized by high covering ability and good compatibility and excellent dispersion with any lipophilic cosmetics products. So this product is widely used in the cosmetics and has excellent effect on applications of other industries.